The objective of this microproject is (for students) to investigate the concept of hardware and sustainability and carry out a joint collaborative work (among students of different nationalities) in which the conclusions of this research are presented. 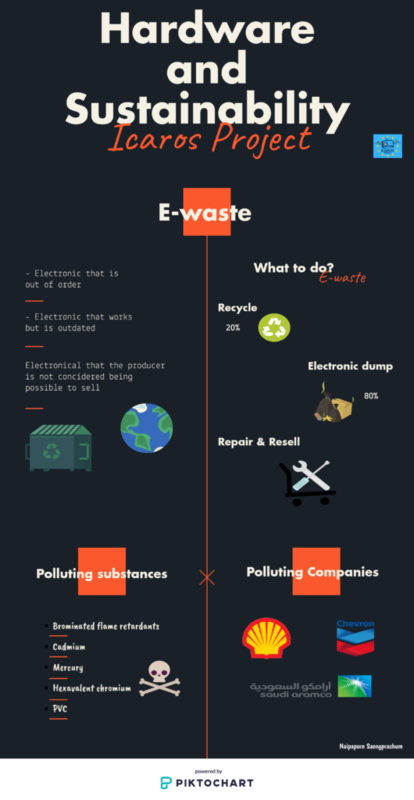 Where are electronic waste processed? 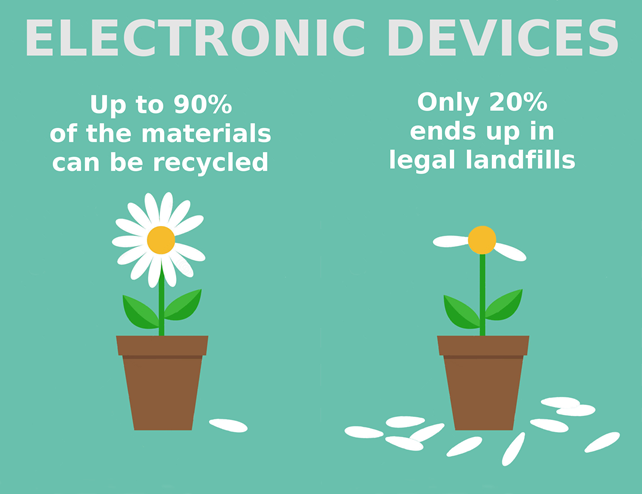 % of the materials that can be recycled from an electronic device. 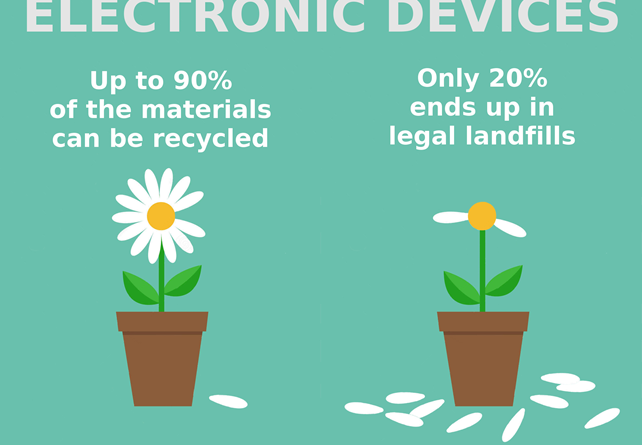 # of substances contained in an electronic device. Heavy metals that contain electronic devices. 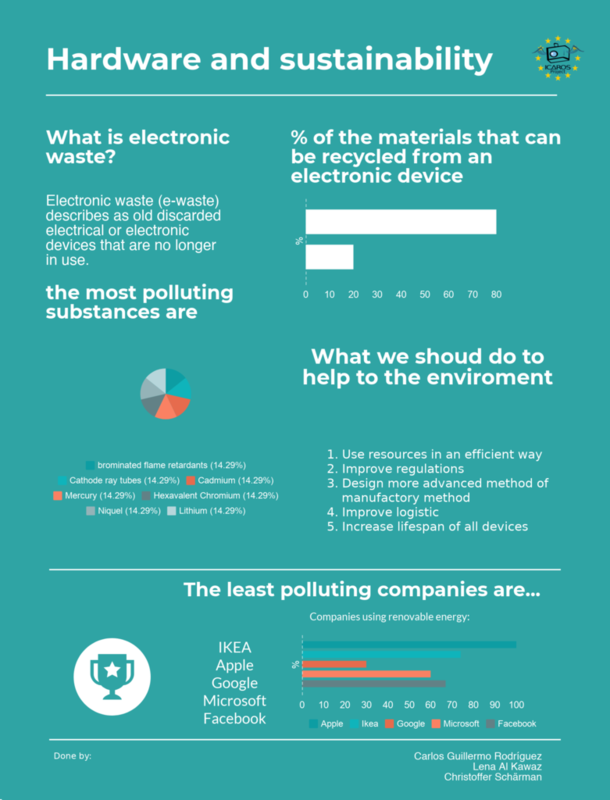 What are the most polluting substances that an electronic device has? Which are the most and least polluting companies or companies? Advices on hardware and sustainability. Create one or two infographics with the acquired knowledge. The infographic will contain images and text. Teachers of each nationality will create a list of students who will participate in the project. Groups of two students of different nationalities will be set. There won’t be groups of three or more students. The students will investigate the proposed concepts. Students will create a shared document in Google Drive and they will communicate in slack in order to create one or several infographics. English will be used to communicate in between group members. The most complete and best designed infographics will be chosen and published on icarosproject.com. 1º Communicate with their partners in the group. 4º Create an infographic (collaboratively) about the information above. The infographic will have part of the information above. Each group will decide the information and pictures that they are going to include in the infographic. Important: Students will have to check if they are allowed to use the picture without problems of copyright. They should use free or creative commons pictures following the instructions of the copyright.